For the Nintendo DS game, see MySims: Kingdom (Nintendo DS). 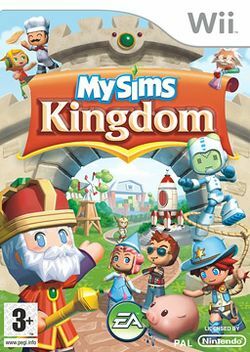 MySims Kingdom is a simulation game for the Wii and Nintendo DS, developed by EA Redwood Shores and published by EA Games. It is a follow up or sequel to MySims, using a fairytale/medieval theme. Its release is planned to be in the Fall of 2008. Characters from the previous game return in MySims Kingdom, in addition to plenty of new characters. The game for Wii differs from the DS version, and this guide applies to the Wii version only. In a IGN.com interview many new features were explained, such as no more boring loading screens: a big complaint from the original MySims. Whenever a loading screen would normally appear, an interactive cut scene will begin and the loading will happen in the background. Some other new features explained were that Kingdom will now have much a better frame rate than the first one had, resulting in smoother animation. The graphics have also been said to be significantly improved. Another new improvement was the inclusion of the new building editor. Instead of going to a workshop, as the player did in the original MySims, players can now enter building mode anywhere in the game, during which the player's character will be shown. The player's Sim can now jump as well, to allow more interactivity to the game. Another new improvement is the variety of characters and places. In the first MySims, there were only 3 main locations: The Forest, Town and The Desert. But in MySims Kingdom there are different islands, for example, Cutopia, Spookane, The Magical Forest of Elves and of course where you start, Capital Island. Another new improvement is the variety of characters. It ranges from a king to a caveman, an elf to a dutchess. You may some recurring characters from MySims as well as original characters. This page was last edited on 31 October 2009, at 18:58.